Tag Archive | "yen loans"
Yesterday’s message Why Worry the Dollar looked at how innovation can enhance the greenback’s value and why investors might want to borrow yen instead of the greenback at this time. America has serious debt and deficit problems. The solutions are either increased tax, reduced lifestyle or greater productivity. Innovation is an important fundamental to track because it is the root of productivity. Increased productivity combined with high employment generates more wealth for all. History suggests that the best social economic model to create productivity is a capitalistic democracy. Democracy in its own right does not stimulate innovation and productivity. Democracy provides the field where desire to work and save can grow. These desires in a population lead to a political, educational legal and physical infrastructure where enough people can enjoy capitalism and strive for innovation and improved productivity. Despite its growing debt deficits and political problems… the United States is still a leader in innovation and productivity. This is why the US dollar cannot simply be borrowed or shorted without great risk. 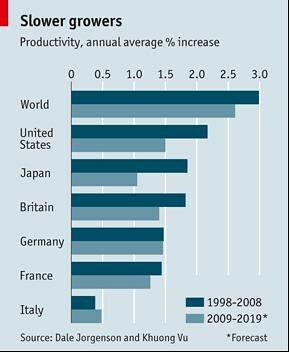 Productivity has surged in America and slumped in Europe. Neither trend can last. Like physical fitness or a healthy diet, productivity is a worthy goal that can require an unappetising change in habits. Producing more by working less is the key to rising living standards, but in the short term there is a tension between efficiency and jobs. America and Europe have managed this trade-off rather differently. America has gone on a diet: it has squeezed extra output from a smaller workforce and suffered a big rise in unemployment as a consequence. Europe, meanwhile, is hoping to burn off the calories in the future. It has opted to contain job losses at the cost of lower productivity. That probably means America’s recovery will be swifter. Further out, productivity trends in both continents are likely to be uniformly sluggish. Analysis by the Conference Board, a research firm, shows just how different the recession was on either side of the Atlantic. America’s economy shrank by around 2.5% last year but hours worked fell at twice that rate, so productivity (GDP per hour) rose by 2.5%. The average drop in GDP in the 15 countries that made up the European Union before its expansion in 2004 was larger, at 4.2%. But hours worked fell less sharply than in America and, as a result, EU productivity fell by 1.1% (see table). Workers that held on to jobs in America and Europe had their hours cut by similar amounts. The reason total hours worked fell by more in America was that there were more job losses there: employment fell by 3.6% last year, compared with a 1.9% fall in the EU. What accounts for this stark contrast? One theory is that the GDP figures in America are overstated. Fresh revisions will take in information from small firms, which may have been forced to cut back by more than big firms because of scarce credit. So GDP could be revised down, narrowing the gap with Europe. Another view is that American firms were panicked into shedding jobs too quickly (though brutal cuts in capital spending suggest that Europeans were scarcely calmer). In fact, much of the productivity-growth gap is explained by different labour regulations. America’s more flexible jobs market makes it far easier and cheaper to lay off workers. In many parts of Europe, by contrast, firing workers is costly and unemployment benefits are generous. Firms think twice about firing, and governments are keener to provide in-work subsidies if it means avoiding payouts to the newly jobless. Unemployment has risen most where workers are easiest to offload, as in Ireland or Spain. The drive for more output from fewer workers seems a threat when jobs are scarce. But over time productivity is essential to improving living standards. Indeed, as the share of working-age adults in the population shrinks, there will be a greater reliance on productivity to drive GDP growth. The chart (above) in the article shows that the US has been and is expected to remain a leader in productivity. The vast size of its very homogenous market, all using one currency, and with great labor flexibility gives the US a great productive edge. Add this to Yankee ingenuity and a social approval of new ideas and acceptance of failure… means that America innovates a lot. America has serious debt and deficit problems. These problems have been growing for 4o years and slowly undermining the dollar. The solutions are either increased tax, reduced lifestyle for many Americas or greater national productivity or a combination of all three. History supports added US productivity… so do not write the dollar off completely. This is why I have been writing about borrowing yen instead of dollars to invest in euro now. See a totally new way to see the Galapagos below. 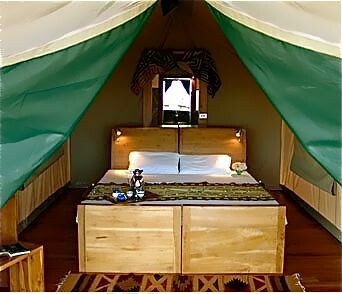 There is a Galapagos camp with nine luxury safari tents perched on a hill, providing comfort and privacy in the wilderness. 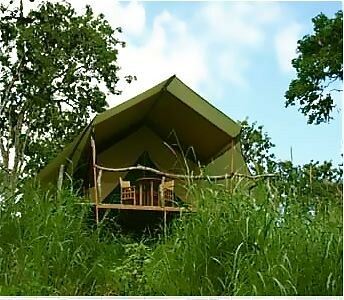 All tents have a balcony with views of this park and the ocean. 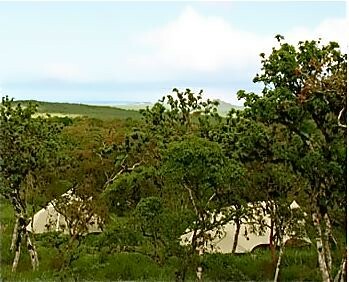 Learn more about this totally new way to see the Galapagos.